Doha post mortem – some green activists 'close to despair' | Watts Up With That? Climate Doom Ahead? Think Twice. Ah, BoJo, how we love you. These Greens are becoming Luddites with iPads. From the Reuter’s article (comments for which are now “closed” after 24 hours – heh). They may be “close to despair,” but they still have access to essentially limitless taxpayer funding, and they will never run out of liberty-robbing, totalitarian ideas for using it. I love the article by Boris Johnson (the London Mayor), the last in the series given in the introduction to this thread. Britain is being forested with white satanic mills, and yet the total contribution of wind power is still only about 0.4 per cent of Britain’s needs. Wave power, solar power, biomass – their collective oomph wouldn’t pull the skin off a rice pudding. Brilliant. Boris for prime minister, instead of that vacuous husky-hugging, wind-turbine toting idiot we have now. Oh, and while you are at it, Boris, please can we have that nice shiney new London airport in the Thames. I am sick and tired of going around in circles above Colchester, and burning a tonne extra fuel per flight (10% extra). And that proposal for a 5.5 degree glideslope to reduce noise over London is pure madness – most dangerous thing I have heard in years. Flying is difficult enough, without placing ‘normal procedures’ on the limits of what the aircraft can do. So come on, Boris, kick Cleggers and CaMoron in the balls and sort out this nation for us. Of course they are sad . . . their gravy train is getting derailed, their ability to foist their eco religious beliefs on everyone is failing and they are starting to twig to the fact they have been conned by the Greenie leaders into honoring and praying to a false god. Reality is such a be-atch. Electric power-generation emissions could be reduced substantially only if switching to nuclear power were allowed to count as fulfilling obligations under the treaties–which it is not. Why not? Because it’s not “sustainable” or “renewable”–i.e., it needs refueling. But those are minor downsides compared to the supposed CO2 catastrophe on the horizon. Correction–they are major downsides to environmental zealots who want to impose their vision of a sustainable utopia on the world. Those zealots constitute the majority of attendees at these conferences, because the attendees are mostly appointed by nations’ environmental agencies, who aren’t going to choose anyone but a greenie. As Stewart Brand and James Lovelock (and Wired magazine) have recognized, nuclear is the only practical option. The supposed hidden high costs of nuclear are partly the result of using non-standardized plant designs; partly the result of using current technology, which has the potential for a dangerous meltdown; and partly the result of excessive costs imposed in the US by regulations. It doesn’t matter if greenies dispute those claims because, if some governments believe them, they will build nukes and thereby reduce their emissions, even at a higher cost than they had anticipated. It is the failure of renewables to remotely live up to the much-hyped promises that greenies made for them that has caused EU governments to cool on them, a failure this article deliberately avoids mentioning. According to the article, it’s just short-sightedness, penny-pinching, dog-in-the-manger veto-ing, and lack of world-wide coordination that’s causing the problem and, by implication, all that’s needed is (the imposition of?) more Will. That’s not going to happen–the trend is going the other way—and it’s denialism to think it might turn around–countries are not going to commit economic hara-kiri, especially if others are not; and “leading the way” will not induce others to follow, as the EU’s failed pioneering has demonstrated. Quite the reverse. So it’s silly policy to bet the house on that outcome. Realistic precaution (prudence) would be to hedge one’s bet by encouraging, for now at least, the use non-renewable but less-emitting power sources like nuclear and natural gas. By continuing to insist that “it’s my way or the highway,” greenies risk being left in the lurch. snif, snif – it just breaks your heart. What happens when a political machinery is left in place long after it’s relevance has dried up? Regrettably the role of the EU in this isn’t mentioned. But, as they say, they’ll go for carbon reduction alone. I wonder what are they smoking. I guess that they are close to despair because the world’s weather won’t do what the computers say it should, and ordinary people are beginning to notice. I love the, “couldn’t make a ham sandwich” quote. But they will sure find a way to make that sandwich cost more. It is good news that no deal was signed. We will not end sqnadering by public officials until there is real accountability in public office. Unlike private practice, there appears to be no consequence to massive failures. In the UK, politicians recently wasted several hundred million on a new computer systen for the NHS, which will never see the light of day. For sure, that example is a drop in the ocean compared to the billions that are being wasted on climate change. How is the UK going to cut CO2 emissions by over 30% by 2020, let alone by over 40%. What is involved in making such drastic reductions. What will be the effect to the consumer and to business (the consumer always paying the cost in the end). No politician ever explains how these cuts will be achieved, let alone the consequences and what life will look like if the cuts were to be made. No grown up thought has gone into this. There has been gross negligence by all the politicians backing this matter. Everyone entering politics should be obliged to post a bond of not less than say $10million which would be available to recompense the tax payer should it later transpire that policies promoted and/or endorsed by that politician were negligently pursued causing a loss to the tax payer. This would help focus the mind of politicians on the real benfits of the policies that they promote. Bad news for those guys is good news for the rest of the world! Maybe we should club together and buy them all a Mayan calendar for Christmas. It’ll be about as useful next year as they’ll be. Why do greens hate shale gas? Because they’re leftists who hate “Big Oil” and anything even vaguely linked to it. Because they’re superstitious luddites who fear new technology. Most of all, because they believe that people should be forced to consume as little as possible to minimise the human impact on nature. Their goal is to create artificial shortages of energy as a pretext for rationing. Their despair stems from the inexorable collapse of their cherished Belief system, and the demise of all of its inherent perks. No more buzzing around the planet to exotic locales at others’ expense, and feeling important and heroic for their “sacrifice” in trying to “save the planet”. No more government funding of pseudoscience nor of “green” boondoggles. No more telling others what kind of energy to use, car to buy, or any number of things that are supposedly “good for the planet”. Woe is them. Seemingly not easily found by googling: List of the 194 countries attending and a list of the subset of 37 countries who signed on to the Kyoto extension… ?? No wonder the greenies are dismayed. The raison d’etre for all these climate conferences is OFFICIALLY going away. And to think, but a few years ago when Kyoto was formulated, on the cusp of moving towards large scale decarbonizating sectors of the economy, nuclear energy, as the clean source of base load electricity generation, was stopped in its tracks by the hue and cry from the very same Greens advocating going green. So the Kyoto Protocol, based upon the successful Montreal Protocol dealing with CFCs, had the substitute for fossil fuels taken off the table as a viable energy source. Unlike Montreal, which had DuPont’s HFC ready to substitute for CFC, Kyoto substituted an intermittent power (solar and wind) source, which is dependent upon subsidies to survive, creates fuel poverty for the developed countries’ most vulnerable (very young and elderly), and is completely out of reach for undeveloped countries. One can not imagine a worst scenario from supposedly brilliant people. Just goes to show you that some very smart people can be awfully dumb. Details have emerged of a deal to solve the “hot air” row undermining the EU in the UN climate change talks in Doha. UN climate talks in Doha have closed with a historic shift in principle but few genuine cuts in greenhouse gases. The summit established for the first time that rich nations should move towards compensating poor nations for losses due to climate change. Developing nations hailed it as a breakthrough, but condemned the gulf between the science of climate change and political attempts to tackle it. The deal, agreed by nearly 200 nations, extends to 2020 the Kyoto Protocol. China’s chief climate negotiator at Doha, Su Wei, “urged developed countries to provide concrete information on fast-start finance as to ensure transparency and guarantee the money is allocated to the support of developing countries. “China’s photo-voltaic (PV) industry, better known as the “solar industry”, is in the middle of a serious crisis. “Nearly all the “big names” of the industry, including companies such as LDK Solar, Yingli Solar (which sports fans will recognize from its sponsorship at recent international soccer events) and Suntech Power Holdings are all facing the possibility of bankruptcy, consolidation, or both following a remarkable few years in China’s solar industry. When it rains it pours: ENSO meter now neutral. Going down! My sentiments exactly. I cannot manage to rustle up even a smidgen of optimism that sanity will in some way find its way to the top at last. He merely summarized in three sentences what everybody else knew but dare not say. Despair often leads to suicide. One can only hope that the “movement” selects that option instead of taking their wrath out on everyone else. Good to see that politicians in the paying nations are waking up or better still feel now confident enough to turn their back on this issue. With the cacophony going on from the early 80’s and the chance that there might be something in it they could not be seen to take the chance. Too many votes at stake. The climate damage compensation package agreed to at Doha will never need to used, the nations claiming on this fund will need to prove that the damage was caused by climate change and not nature doing it’s normal thing. What parameters are being set to claim this. So that is a dud. If any nation was to claim the payers will claim that since it has not warmed for 20 years or more (by then) it can not have anything to do with climate change. If we generalize that it was primarily the right wing thinking part of the public who stuck to the mantra that it is all natural, and the left thinking side following the AGW bandwagon it is time to think about Sun Tzu’s statement in his historic book “The art of war”. The irony being here that the right is right and are left. Konrad: A colleague of mine has correctly said: We are spending a great deal of money to protect the children and grandchildren of the same people we’re allowing to starve today. The amount we’re spending in an attempt to reduce CO2 would be better invested in education and health in the regions that are under threat. Our goal should be to improve economic conditions in developing countries, because that in turn strengthens those countries’ ability to adapt to climate change. The climate treaty is lose, lose. The treaty is not going to “fix” the climate which is not broken. The climate treaty is going to lead to piles of green energy scams, green accounting scams, a massive US bureaucracty, all of which is going to be controlled by the UN. Billions of dollars will be transfered to third world countries were it will find its way to corrupt third world officials. Observations and analysis in peer reviewed journals does not support the extreme warming paradigm. Planetary cloud cover increase or decreases in the tropics to resists forcing changes, negative feedback, The scaring IPCC forecasts assumed the planet amplifies forcing changes which is not correct. If the planet’s feedback response is negative, a warming due to a doubling of atmopheric CO2 is less roughly 1C, with most of the warming occuring at high latitudes which will cause the biosphere to expand. So called safe warming is 2C. Mission accomplished. There is no climate crisis to fix. The problem that needs fixing is the massive waste of funds on green scams which will not significantly reduce the rise of atmosphere CO2, such as the conversion of food to biofuel. Also, I suggest we forget the analogies with military conflict (war) when discussing climate science and all the related economic / social / political topics that use climate science research results. This is not a war in any sense; it is inherently a much more fundamentally important activity than mere war. It is the >>2,000 year old ‘eternal’ philosophical dialog where it is decided whether reason and science or ‘something else’ will decide whether we have individual focused voluntary societies or collective focused coercive societies. This dialog is required continuously because of man’s nature, we must be always vigilant. Fact! This stupidity and flagrant waste will not stop until the money is cut off. If it will make the warmist feel better let them flog one another for a time. Once the welts from that heal, they will understand selfhealing better and when will tell them to quit the lies and heal themselves they will have at least one experiance to learn from. China’s chief climate negotiator at Doha, Su Wei , “urged developed countries to provide concrete information on fast-start finance as to ensure transparency and guarantee the money is allocated to the support of developing countries”. “Sooo Whee” and “Sooo Whey” are the traditional swineherds call, to bring hogs to the slop trough. Ironic, isn’t it?? I’ve noticed that recent climate conferences have closed with an awful lot of despair in the MSM. I don’t know if I buy these despair claims. Seems to me they are making progress towards their goals after each meeting and the media or the NGO’s talking to the media are playing to us by BS’ing us with the despair line. I also saw that there was some kind of an agreement to create an international organization that would allow developing countries to sue developed countries for extreme weather events. This shows me it’s always been about finding a way to get access to our wealth. Imagine a world where the US is a country among others in a UN system. All the poor countries would be voting themselves our wealth, just like what’s going on today in the US in politics with welfare, obamacare, etc.. They are close to the CO2 cliff. Just a little nudge of Facts should do. …How is the UK going to cut CO2 emissions by over 30% by 2020, let alone by over 40%…. Oh, but they have a new song that they’ve got the kids singing. Fukashima, TMI, Chernobyl, et al. are not current technology, but rather first generation. Current is third generation. Even so, TMI represents just about the worst that could happen to a U.S. first generation plant and…no deaths…Fukashima was a completely unnecessary bulloxed-up mess and…no deaths. Chernobyl was Russian and an idiotic design. Period. Darn! , and they were so close to free money for new beachside resorts and condos. “The extraction process alone would generate tens of thousands of jobs in parts of the country that desperately need them. And above all, the burning of gas to generate electricity is much, much cleaner – and produces less CO2 – than burning coal. What, as they say, is not to like? If the Greens were seriously interested in lowering emissions of CO2 or “saving the Earth” they’d be all over this, whooping in delight. They are not. They show their true colours (watermelon colours – green on the outside, red on the inside) by not celebrating such an abundant, cheap and above all, CLEAN source of energy (less CO2 – their primary concern). Their interests are not what they claim they are. They never were, but here is the proof of it. They don’t want anything that works. They don’t want people to have energy. They don’t want people to have control. They want to TAKE AWAY energy and control. They don’t want civilization to go on. They are angry and frustrated that Mother Earth is not cooperating. We’re not getting warmer. Worse, now there’s enough oil and gas found to keep us going for centuries… Dang, Nature can be a [self-deleted]. You know, I remember when the argument that we should stop using fossil fuels was based on us running out by the year 2000. This was before all that warming became the convenient reason why. So grinding down civilization is what they want. It always was – warming/changing/weirding weather had/has nothing whatsoever to do with it. Now, these poor buggers can’t even go back to THAT claim when the world is chilling (pun intended) on CAGW. The extremists must have a few arteries popping about now, they are so intense! No wonder, they are running out of delusions to offer us. Oh, shouldn’t various governments stop wasting money on these stupid COPs? How many non-events do they need before they accept that no means no? Exactly what part of “No” don’t they understand? Difficult times lie ahead for the movement especially as there is no quick fix for the present financial crisis which looks like continuing for another decade. As Lord Monckton pointed out there has already been 15 years without statistically significant increase in temperature, but the pressure will rise a notch as soon as this becomes 17 years because AGW proponents have already described 17 years as a significant period for establishing whether their models are off target. This will also coincide with CO2 reaching the 400ppm level which is also pschologically a significant milestone. Those preparing the latest IPCC report no doubt have this in the back of their minds. It may either temper their projections (knowing that wild projections will soon come unstuck unless they are reigned in) or they will see the next IPCC report as the last chance to bring about the change they seek (because in a few years time the wheels will truly be off the wagon and it will become ever more difficult to make out their argument, in the light of an on going stasis in temperature notwithstanding that by then almost 40% of all manmade CO2 emissions will have occurred). The long game favours those that are not alarmist in nature. Lets hope that our woolly liberal politicians have not committed us to economic suicide before then. John Whitman I agree not military analogies, analogizes of criminal behaviour and blithering incompetence within our civil services work better. What might blow the lid off this mess, is just one government launching an inquiry into its own culpability in wasting public resources, on false alarmism. I have suggested our Canadian Conservatives use this as an opportunity to kill the beast and ram a stake through their political opponents. I have been making enquiries of Environment Canada since 2009, with little to show for it. Once the worm turns the political wings of the antihuman hysterics will be hammered. Its turning as our wealth vanishes, so won’t be long now. A really creative conservative group could demonstrate the treacherous duplicity of our liberal leaders. Agitating to destroy our common wealth and value systems, using and abusing legislative powers, lying, failing to do sworn duties, destabilizing civil society….. Problem for the politicians who have been trying to force feed the CAGW dreck, are you stupid? Or evil? I agree. I didn’t agree with the link I posted–that’s why I put the phrase in quotation marks, followed by a dismissive “etc.”–to indicate it was from the article. The article is an indication of their desperation. If they had an skerrick of integrity they would have walked. What I have really enjoyed is the flurry of pseudo science hitting the media in the lead up and during Doha trying to act like eco viagra to keep the kindred spirits resolve stiff, so to speak. The latest doozy is the Nature Climate Change “report” that the 1990 IPCC “prediction” was spot on that got home page treatment from the AB frigging C, our national broadcaster here in Oz, with the usual case of the Trotskys. A precise prediction one of the usual suspects pontificated. LOL. 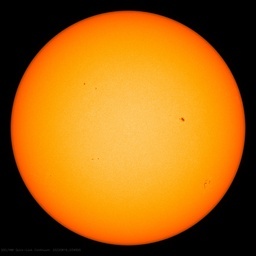 After seeing the latest solar activity data I am about ready to order me some more popcorn and settle in to watch the rest of this C grade melodrama play out, just to see the evil eco cretins get their comeuppances. If they despair, then only because their gravy train is grinding to a halt and they have no idea what con they can perpetrate next. These days I’m convinced they are stupid AND evil. They sound so ethically correct. They appear to offer a decent return on savings in these troubled times. Yet carbon credits are at the centre of increasingly adventurous scams. And last Tuesday morning, police investigating a suspected fraud network of investment firms selling worthless carbon credits arrested ten men and a woman in co-ordinated raids on offices in the City of London, Essex and Hertfordshire. The raids follow mounting official concern at the scale of carbon credit scams, where investors pay thousands of pounds for overpriced certificates that are said to be linked to environmentally friendly projects such as tree planting. As police continued their enquiries at Hudson Forbes, one of the company’s bosses arrived, apparently late for work. I they might already be throwing stuff against the wall to see what sticks. Didn’t Anthony post something about a show that aired about what would happen if the Earth stopped spinning? 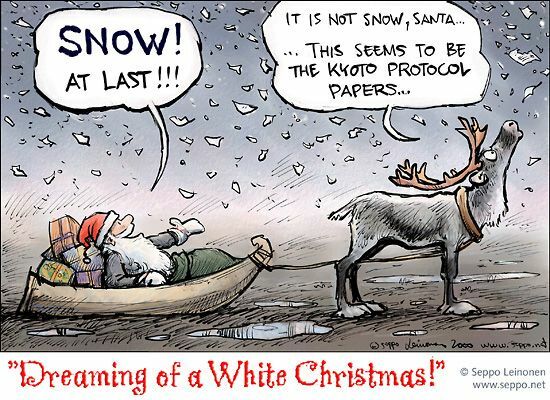 I checked out the website of the guy who did the cartoon (cos it’s Finnish and I have Finnish friends, etc). He’s obviously a warmist and links to a 350.org campaign that claims that fossil fuels get 6x the subsidy that “renewables” get. So I tried to follow this back to check out the data supporting the claim but it just petered out on another green campaigning site (and no comments section on either of course). So – anyone know of how they came up with this claim and what the actual figures are?? the bbc needed someone to comment on the farce tonight so they went to th UEA. The lad sounded a bit desperate on the bbc tonight. The edifice continues to crumble. On the contrary–Doha just had major pollution cut from their city. The participants should take pride in the fact that actions speak louder than words. What’s the next unfortunate location for this emitter of pollution? That’s good because their stupid side will trip up their evil side. We’re seeing the fall in motion – slow though it is. It has become their whole life…the fact that CO2 greened the earth in the first place was always lost on them. The next bit is to witness how the politicians and the media get themselves out of this mess. 10 Dec: UK Telegraph Editorial: Has Doha finally laid the ghosts of Copenhagen to rest? In terms of fighting global warming right now, it is a failure. But by finally sorting out the Kyoto Protocol and moving towards a global deal where both rich and poor countries cut carbon, could the Doha Deal finally move the world towards the treaty first hoped for in Copenhagen? Ok, it wasn’t the best place for the latest United Nations climate change conference. After a meeting in a city based on gas this year, the next meeting of the UN climate change talks will be in Warsaw, Poland, that relies largely on coal, and after that possibly Venezuela, one of the world’s biggest oil producers. But the really key meeting in 2015, to finally move the world towards a low carbon economy, is expected to be in France. Are there experts in international law in the EU countries and the 8 other countries that supported the amendments of the Kyoto Protocol specifically the extensions of the protocol to continue to continue as of January 1 2013. While the UNFCCC secretariat is mandated to work on the second commitment period of the Kyoto Protocol seven years ago, the results of those negotiations has to comply with Article 21 and 22 of the Kyoto Protocol itself. One of the requirements is to circulate six months before the meeting of the parties the text of the amendments for discussions. A visit to the Kyoto Protocol website on amendments will show that the last notice by any member country is on 2009. ( i hope readers will save that website) and nothing on the documents submitted to Doha. Second, the amendments will only take place when three fourths of the parties have deposited the concurrence to the amendments. Seems to be a necessary conditions as the negotiators will need concurrence from their government on the commitments made especially those commitments taken in the last minute. As the protocol is expiring on December 31, 2012, and if the extension is not valid how could you extend a protocol that is no longer in existence ? If the protocol is ratified not just an amendment will it trigger the two requirements for ratification which is 55 per cent of the signatory countries or members or members of the UN ( easily done as there are more than 110 developing countries waiting for the rain of money from EU and the 8 other developed countries) and the second requirement that among the countries in Annex I of the UNFCCC ratifying the treaty they must have an aggregate of 55 per cent of the greenhouse gas emissions. ( a difficult conditions as the EU and 8 other industrialized countries have less than 30 per cent of the Annex I greenhouse gas emissions. In fact if Russia did not ratify the original Kyoto Protocol with the US , it would never have come into force as US and Russia accounts for almost 60 per cent of the GHG emissions from Annex I countries.) In fact, the amendment procedure of the Kyoto protocol under Article 21 and 22 could result to a funny situation if all the Annex one countries withdrew and all the developing countries agree to extend it. There could be a protocol to reduce the GHG but nobody will be doing any reduction. Any legal experts to make a detailed analysis on the validity of the amendment and the requirements for the amendments if they are valid to come into force ? The deal obliges 37 industrialized countries — the 27 members of the European Union, Australia, Switzerland, and eight other states — to cut their greenhouse gas emissions by the end of 2020. What gets me is that these scenarios repeat themselves each year. Same result. Definition of insanity, isn’t it? Glad it’s over for another year. But they’ll be back. the reuters article was a little dig! Time for the way-back machine again me thinks. anyone? RobW’s link above has a global warming poll. Let’s all go answer their poll so the don’t get the answer they want. are you censoring comments here??? Or is it Word press doing that. let me know so I don’t visit here anymore. OK??? If its word press then you should know about it and go to a different website that does not censor truth or comments. And that proposal for a 5.5 degree glideslope to reduce noise over London is pure madness – most dangerous thing I have heard in years. Flying is difficult enough, without placing ‘normal procedures’ on the limits of what the aircraft can do. Words are wonderful things – sometimes they mean only what the person using them intend for them to mean. “Subsidy” is one such word and until you and the other person agree on the meaning the conversation is bound to be confusing. Say I want to buy a green car. In some places in the US I can get a Federal payback, cash from the State, perhaps a discount by the manufacturer, and some other perks (use of fast lanes on urban freeways). What part of this should be counted as a subsidy? If a company wants to build a wind tower it might get, say, a multiyear government enforced contract saying the electric utility has to buy the power at a price much higher than the regular rate. Users of electricity have to pay a higher price for the power they use but because of the way it is collected and paid to the wind turbine company some might not agree this is a subsidy. In the USA, some expenses are “deductable” but others have to be “capitalized”, meaning the business expense is considered as long term and is depreciated over time. In some circumstances this processes can be accelerated. The purpose from the government’s point of view is to encourage investment, job creation, and efficiency. Some folks believe this sort of accounting is a “subsidy” in the same sense as a cash payment to buy a curly-tailed light bulb. Green companies or those parts of larger corporations are quite small when compared to the international petroleum companies, large refineries, and related power corporations. Thus, the numbers are very large for very large corporations and much smaller for the tiny players. The issue ought to be based on cost per unit of power produced (or some such thing) and not on the raw size. My comments are very general and maybe others will correct or add to the above. The 6x claim you cite and actual figures may need a lot of investigation before you can say what is really happening. Good luck. there are some subsidies, but they are actually really small. 1: royalties paid to foreign countries and states are credited for tax purposes…. as it should be. if you paid for raw material, it has be considered as expense. 2: research credit that is available to ALL INDUSTRIES is available to oil&gas. there is nothing special here. 3: govt pays poor people for heat. that is welfare. not a subsidy to oil&gas. That money can be used for electric heat, even if it is hydro electric or other “renewable” source. 4: investment credits available to everyone is available to oil&gas. where is the subsidy there? $1.7 billion in Domestic Manufacturing Credits: Applies to all production companies equally. A reward for creating/leaving the jobs in the US economy. You can argue whether or not they can move this production from the US, since the oil is located here, but it is clear that they can move the exploration equipment to anywhere in the world and ship the oil in. There is no requirement that oil used domestically must be produced in the US. So given that, what other industries should we strip this credit from? $1.0 billion in % depletion allowance: Applies specifically to the oil and gas industry as a mechanism for capital recovery. It takes the place of depreciating the assets in the ground. Of course we don’t like to talk about the dark side of this one, which is when oil prices are lower for a sustained period of time, it acts like an anti-subsidy, so this one can cut both ways and at time has. Easy solution is to use capital base instead of income. Over the long haul though, I doubt this equals $1.0 billion a year. Just $1.0 billion a year in the current price environment. $0.9 billion in foreign tax credit: This one again, applies equally to all. The dodgy part with this is classification of royalty payments as income taxes. Some foreign governments have converted royalty payments to income taxes, allowing for greater deductibility under US tax law. This, however, is not unique to the oil industry. So again, who else would you like to strip this one from? $0.8 billion in intangible drilling costs: This one is specific to the oil and gas industry. This however is not a subsidy. Period. Exclamation Point! At best, this is a shifting of tax payments to later years. It allows the oil company to deduct their exploration expenses immediately. When this rule was enacted, it actually made sense because 90% of those expenses were written off in the first year anyway because of the abysmal hit rate for new wells, as opposed to the alternative which is adding it to the depreciation base for a new well. Now that the hit rate is much better, maybe it’s time to rethink the break, but it will not provide an $0.8 billion dollar annual windfall. It might provided a short term difference, but after 4-5 years under the new rules, you’d be pretty much back to the same annual number for “tax breaks” resulting from intangible drilling costs. Firstly, all Oil Companies pay taxes on earnings just like any corporation. According to data found in the Standard & Poor’s Compustat North American Database, the industry’s 2009 net income tax expenses — essentially their effective marginal income tax rate — averaged 41 percent, compared to 26 percent for the S&P Industrial companies. The Energy Information Administration (EIA) concludes that, as an additional part of their tax obligation, the major energy-producing companies paid or incurred over $280 billion of income tax expenses between 2006 and 2008. That $4B amounts to 1.6 cents per gallon of gasoline. Did Schumer also propose an end to Federal, state and local gasoline taxes to ‘even the playing field’? One favorites of Pelosi is the reduction in royalities that was set up during the Clinton Administration to give companies an incentive to drill in deep water offshore in the Gulf when oil prices were low. Royalities are still paid but circa 20 % less. It was a good business deal for both sides at the time and improved for the drillers as oil prices rose. So now many of the tax and spend crowd want to change the contract and threaten those who refuse to comply with blackballing them from biding on new leases. How else can they make renewable energy sources look competitive? Another item frequently referenced is the accelerated write off of capital expenses to encourage investment and boost the economy that is offered to every other business. A third item is the foreign tax credits offered to all companies that bring foreign earnings back to the US. There is a hidden subsidy for both solar and wind power, one that could easily be avoided, but never will be because it is not politically expedient. The subsidy is the amount of money it takes to remove solar and wind farms once the parent company abandons them. It usually winds up being public money that is used, since the parent companies usually go bankrupt and are dissolved. It could easily be avoided if the parent companies were forced to post a bond equal to the amount it would take to remove the equipment, and restore the area. And that is a subsidy which coal and oil do not enjoy, because they are forced to remediate their mining and drilling sites. So subsidies per MWh to Wind and Solar are 100 – 1500 times the cost of subsidies to the Big oil. You didn’t really think your question through did you? According to the link you provided $58B was paid globally in so called oil subsidies. In 2004, according to energy.gov, we in the USA used 140 billion gallons of gasoline, for which $70B in taxes at the pump was collected. And don’t for get the corporate tax on the wholesale sales, and the taxes paid by the oil employees to make the gasoline, etc. So where is the subsidy? Your so-called oil subsidies are smoke and mirrors, nothing more. The United Nations climate talks in Doha went a full extra 24 hours and ended without increased cuts in fossil fuel emissions and without financial commitments between 2013 and 2015. Best news I’ve had in months…. Given the Fiscal Cliff vs Obama-Tax-To-Death-Recession, by the time 2014 gets here there will not be any chance in He….ck that the USA can cough up even one red cent. (As the penny, now made of cheap zinc, is over 3 Cents each to make, the penny is unlikely to survive that long in any form…) The EU, headed for a collapse / break-up and/or having Greece, et. al. sucking every spare Euro out of the northern countries that have some; will also be unable to pony up any dough. Russia has bailed along with Japan and Canada, so no joy on the Rubles and Yen. China? Don’t make me laugh. Just spent some $Billions to buy a LARGE chunk of Canadian Tar Sands. You don’t spend big $Billions to buy oil for the next decades for the purpose of not using it. Sorry to read that… I have relatives there. Still, when the heavy snows of this winter fall, perhaps folks will realize that it’s better to be warm and repudiate the “treaty” than frozen and PC. Real world operations data has had time to be booked. Engineering Reality. The Chinese are also buying up large tracts of land in Australia for actually growing food for export to China. This is guess work on my part, but there are 42 Annex 1 ‘developed’ countries that signed the Kyoto Protocol. If you take out Canada, USA, Japan, Russia and New Zealand, (which are named in various reports to have not agreed to the Doha extension) that would leave 37. Don’t mean to post twice, but for those countries looking to join the EU, they have to agree to abide by the rules of the Kyoto Protocol. So this would imply countries like Iceland, Croatia and Turkey did sign, because they must if they seek to join the EU in the near future. Yep, in the UK we have our own “Al Gore”. He is called Ed Davey and happens to be the Secretary of state for energy (and climate change), and that is what he came back with. He is the sort of guy that would walk out of a car showroom having just negotiated a purchase price higher than the original sticker. But then, intelligence is not a prerequisite to power. Still, he has to get his wizard plan past Ebeneezer Osborne first. With words, with weapons, with tax money and bogus science. With bogus science you justify the tax money to buy the weapons and you start the disagreement with words. At least one country’s intelligence service predicted resource wars because of climate change. This is how you start it. The name of the religion has changed but that is about all after 2000 years of “civilization”. All this is the cost of living in a democratic society, lighten up. We will survive no matter what happens. Gentlefolk: Any data backing up Johnson’s contention here (http://www.telegraph.co.uk/comment/columnists/borisjohnson/9733518/Ignore-the-doom-merchants-Britain-should-get-fracking.html) that the US has in fact MET what would have been its obligations under the Kyoto protocol (had the US ratified it)? If true, that should be front-page news–but I can’t find any sources other than Johnson’s unverified contention in the op-ed….. any help appreciated. Failed lottery tickets can be a real downer. According to info I came across, in America, it would take One BILLION, Five Hundred Thousand wind turbines to replace the amount to energy currently generated by coal. I shutter to imagine the American southwest (Arizona, New Mexico, Utah, Nevada & who knows how many more states? ), covered with solar panel plantations, meant to provide green energy. But then again, just like wind, their efficiency alone (or is it lack thereof? ), would call for 40% more of whatever systems they propose, plus, that still does not solve the very real problem issue that these technologies are intermittent! Exactly what does one do when the wind does not blow or the sun is not shinning? Oops!!! Imagine America with 1.5 Billion turbines dotting the landscape, only where wind generation is functionally practical? Lady Bird Johnson was upset with all the billboards dotting the landscape along our highways & byways. She would become apoplectic if she saw all those turbines!! The “real” problem for the green movement is, their catastrophe scenario’s are not materializing. Atmospheric CO2 levels have either stabilized or in fact, gone down. Many disingenuous will openly deny this reality, especially on TV where numerous cause complicit media types will back up any lie or distortion from reality the greenies spew. The natural gas discoveries in America through fracking, has shut down their babble & shown them to be the hypocrites many already knew they were. Prior to those gas discoveries, natural gas was at least OK. Once we found out our supplies could sustain us & free us from foreign oil dependency, then the greenies attacked natural gas with a vengeance. What hypocrisy! The green movement is NOT about saving the environment. Its about political control & wealth accumulation by zealots & those who have been financially sponsoring them. It global control through socialism. Power!!!!!! “Close”? Let’s push them the rest of the way.